Originally built by the archbishops of Salzburg in 1358 as a guesthouse, 300 years later it became the estate of the Mülln monastery. At one time, the University of Salzburg operated the castle as a leisure center for its professors. 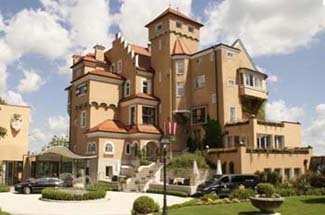 Recently remodeled to even greater elegance, this five-star castle hotel attracts a clientele that returns year after year. The atmosphere here is refined, quiet, and terribly romantic. Rates include breakfast, tax service. Mönchsberg Hill overlooks the old city. An elevator connects the park (5-minute walk from hotel) with the town below (Anton Neymayr Platz). Free parking for hotel guests. A popular locale for weddings, a small chapel dating from 1500 sits right next to the front entrance. Rising above the center of Salzburg, the Mönchsberg is a large city park of wooded paths, trees, flowers, and benches to sit on while watching the view and listening to the chirping of birds. The hotel, located toward the north end of the park, offers an idyllic atmosphere of privacy and tranquility. The castle’s unique exterior is a mixture of towers and step gables half covered by clinging ivy. Lawns are filled with brilliant flowers. The elegant and refined interiors are decorated with crystal chandeliers, Oriental carpets, brocade upholstery, and leaded windows. “The Smallest Restaurant in the World” holds one table and is located in the castle tower. Of course the view is fantastic.